The model 550D single Vertical Jet Electropolisher is designed to perform dislocation free thinning of materials for subsequent analysis in a Transmission Electron Microscope. This extremely versatile instrument can be used to thin materials and alloys electrolytically with corrosive electrolytes; or to thin non-metals and semiconductors such as gallium or arsenide, chemically, using nitric hydrofluoric or bromide-methanol solutions. A new non-acid electrolyte has been developed to thin such materials as YBa2Cu3Ox high Tc superconductors, gold and other traditionally difficult materials. Its high sensitivity is capable of routinely detecting perforations less than 10µm in diameter and its smooth polishing action yields large usable thin areas. Jet electropolishing is accomplished by pumping a stream of negatively charged electrolyte against the surface of a positively charged sample. This process is used to create a dished or dimpled area and is continued until perforation of the specimen occurs and the operation is automatically terminated. Termination is controlled by varying the brightness of an LED which is mounted above the jet nozzle and whose light is carried by a light rod through the jet stream to the sample. The sample is easily mounted on a pedestal above a sapphire light rod which carries the light to a photodetector. When a perforation is detected, the jet pump and LED are automatically turned off and the audible alarm and reset light are activated. The sample is easily removed by swinging the jet head to one side and removing the pedestal. The sample can be quickly flushed while still mounted on the unit using either the optional Automatic Timer and Rinser or the standard manual rinsing assembly. The entire process can be visually monitored using a magnifier which is a standard feature with the Model 550D. The shape of the dimpled area can be easily controlled by varying parameters such as the flow rate, jet nozzle diameter and jet nozzle height. 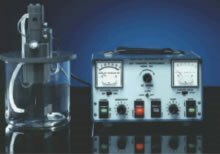 An electrolytic unit can be easily converted to a chemical unit by utilizing the Chemical Conversion Kit or by purchasing a separate Chemical Thinning Head. The Model 550D is often used for chemical thinning because of its corrosion resistant construction. Since the sample is not immersed it can be easily rinsed to stop chemical action. When using harsh chemicals that would attack the stainless steel parts or quartz light rod that come into contact with the solution, the affected parts are easily replaced by chemically resistant PVC or "PTFE" parts and a sapphire light rod. The standard pyrex reservoir can also be replaced with a polyethylene reservoir. When thinning semiconductor materials such as silicon which is transparent to infrared light, a visible light LED is easily substituted for the standard infrared LED. A chemical unit can be easily converted to an electrolytic unit by utilizing the Electrolytic Conversion Kit or by purchasing a separate Electrolytic Thinning Head. A 2.3mm or 3.0mm diameter disc is placed on the sample holder which is subsequently threaded onto a positively charged electrode. A polyethylene diaphragm with a hole in the center may be placed over the sample to limit polishing action to the central portion of the disc. Standard pedestals are stainless steel, but pedestals with a platinum tip are available when thinning with highly corrosive chemicals such as perchloric acid solutions. For single sided thinning the sample is simply thinned until automatically terminated. For double-sided thinning the sample is thinned to a particular point of interest and simply inverted on the pedestal and thinned to perforation. Double-sided thinning with a single jet ensures that your point of interest is located in the electron transparent area. The Model 550D comes complete with specially designed electronics to control the operation of the unit. The filtered DC power supply has an output of 0 to 300 volts and a current capacity of 150ma. Meters have a mirrored movement and ranges of 30 and 300 volts for the dc voltmeter and 30 and 150ma for the milliammeter. The power, automatic reset and mode select switches all utilize multi-color lighted switched which makes their position easy to determine. The mode select switch is used to operate the viewing lamp or to operate the pump for alignment, cleaning or testing. The mode switch is also used to place the sensing system into automatic termination mode. A momentary polarity reversing switch is also provided which is often used to remove oxides from the surface of the sample. Adjustments for light sensitivity and pump motor speed are conveniently located on the front panel as is a switch for deactivating the audible alarm. For chemical thinning, where electrical contact is not necessary, a sample is waxed to a 4mm diameter mylar disc which is subsequently waxed to the "PTFE" pedestal. The mylar disc serves to protect the sample from back etching while also providing a transparent path for the automatic detection system. Electrolyte temperatures in the range of 60°C may be used and are easily achieved by placing the reservoir in an isothermal bath. A small hole in the side of the pump head produces a jet stream that stirs the solution and helps to maintain a uniform temperature. The reservoirs are supplied with covers so that they may also be used for electrolyte or chemical storage. When thinning operations are complete, the electrolyte may be easily flushed from the jet assembly by placing the head assembly on an extra reservoir containing water or alcohol and running the jet pump. More accurate control of jet flow rate, height and diameter allows user to easily adjust parameters for the preparation of a wide variety of materials. More amenable to highly viscous electrolytes which enables the use of non-acid electrolytes such as the BK-2 solution often used to thin YBa2Cu3Ox High Tc superconductors and other traditionally difficult materials. The sample, which is not immersed in the electrolyte, can be viewed through a magnifier during the entire thinning operation thus allowing the user to monitor and more easily control the thinning process. The system is amenable to semiconductor chemical polishing as it will withstand such harsh chemicals as HF and bromine solutions. As the sample is not immersed in electrolyte, it can be quickly and easily flushed after perforation without removing the sample holder from the unit. The Model 550D uses a higher voltage power supply than twin-jet units which enables thinning of many materials that cannot be thinned at lower voltages. A direct coupling between the infrared LED and the detector provides greater sensitivity and the ability to routinely detect perforations of less than 10mm. Automatic termination prior to perforation is possible with some materials. Surface polishing of an entire disc can be accomplished utilizing a 3mm diameter nozzle. Sample polarity can be reversed which can be used to remove oxides from the surface of some materials. Simple to operate at low temperatures and has been used extensively at -60°C with perchloric acid electrolytes. Permits thinning from 1 side without etching back side to examine surface regions and sample can easily be reversed for two sided thinning. It measures elapsed time in minutes and seconds using an LED digital display and stops automatically when the system triggers off. A predetermined amount of time can be set to automatically shut off the system. This is particularly useful for thinning to a specific depth in a sample. The rinsing system can be used in either automatic or manual mode. In automatic mode, the sample will be rinsed with water or alcohol immediately after the system triggers off. The manual mode can be used if additional rinsing is desired. This kit is used to convert the Model 550D chemical unit into an electrolytic unit using 2.3mm specimens. Conversion time is less than 30 minutes. This kit is used to convert the Model 550D chemical unit into an electrolytic unit using 3.0mm specimens. Conversion time is less than 30 minutes. This kit is used to convert the Model 550D electrolytic unit into a chemical unit. Conversion time is less than 30 minutes. Although the Model 550D was initially designed for thinning TEM samples, its well controlled operation lends itself to many special applications. One of these applications is for the selective etching of GaAs and GaAlAs samples. This capability simplifies the fabrication of LEDs and MQW devices and offers a means to prepare samples for spectroscopic analysis of GaAlAs epitaxial layers. We are always interested in learning about your special applications and are pleased to share our experience with you. The model 550DC includes everything necessary to operate.